Money and fame can lead to some pretty questionable decisions. These celebrities made questionable decisions about their looks and destroyed them with an overabundance of plastic surgeries. You may not even recognize some of your favorites after all of the work they have had done! Check out this list of 15 celebrities who took augmentative surgeries way too far. Vice President and Chief designer of the Versace group, Donatella will never have to worry about money. We just wish she weren’t spending the majority of that money on plastic surgeries. 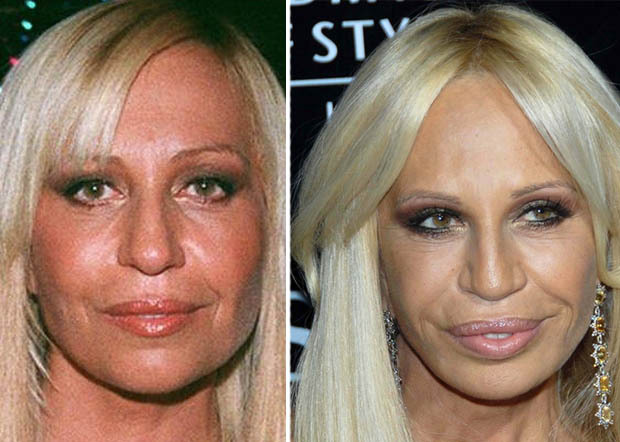 Donatella’s face has changed so drastically it’s difficult to recognize the fashion mogul. She used to have such a natural beauty, it’s a shame that her desire to remain impervious to aging has destroyed much of those good looks.